A lot of creative (and employment) ferment went on inside the animation industry during the year. The L.A. cartoon business hit an all-time high in employment. The Animation Guild had 3400 artists, writers and technicians working under its jurisdiction. Feature employment was up and down (Disney hired more people as Frozen rocketed into the stratosphere, while DreamWorks Animation continued laying off artists as some of its features under-performed)*. TV animation was percolating merrily with lots of new and continuing series. Yet while cartoon work was up overall, wages were remarkably stagnant. (This is in sharp contrast to the 1990s, when wages marched upward in lock-step with rising employment. Hmmm. It couldn't be that there's some kind of collusion going on or something?) Our corporate overlords are nothing if not honest, upright, and law-abiding. So banish thoughts of conspiracy from your suspicious mind. Inside the Guild, President Nathan Loofbourrow departed (due to a new job in Montreal) and TAG started upgrading its website. We successfully organized some of L.A.'s non-union animation work and continued campaigns to organize other shows. We started planning for 2015 contract negotiations. ... [T]he market for domestic and foreign animation in Japan reached 242.8 billion yen (about US$2.03 billion) over the course of the year 2013. According to the Media Development Research Institute, this is a record high for the industry, topping 2006's 241.5 billion yen (about US$2.02 billion at current exchange rate). There were over 100 features produced in the far-flung corners of the globe, and animation continues to be a strong profit center around the world. California passed its own movie and visual effects wage subsidies, the better to compete with the hand-outs of Free Money taking place in Canada, Britain, France and other places. 1) Television animation will continue to prosper. 3) Employment will remain robust, even as studios strive to pay as little as possible. Lastly. We wish all of you a happy and prosperous New Year. If your 2014 was rocky, we hope you enjoy nothing but smooth sailing in 2015. And if the year now departing was great, we want the new one to be even better. * DreamWorks Animation is a study in contrasts. The feature division laid off hundreds of employees after "Rise of the Guardians" failed to turn a profit, and laid off more feature employees in the second half of 2014. At the same time, DreamWorks Animation TV continues to expand and hire personnel as it increases production on its huge Netflix slate of shows. Long ago, I interviewed character actor Edward Herrmann for the Disney Publicity Department (I was moonlighting from Disney Feature Animation). Edward H. was promoting two features: Take Down, an indie that the company had picked up for distribution, and The North Avenue Irregulars, an in-house Disney comedy, mildly amusing and moderately competent, as many Disney live-action comedies were in the late seventies. "Dear boy, I didn't plan ANY of it. I finished one thing and then looked around desperately for what was available to do next. There was no strategy, no master plan." "Besides being an accomplished actor, was also a true gentleman and a scholar, as well as being an incredibly kind and decent man. 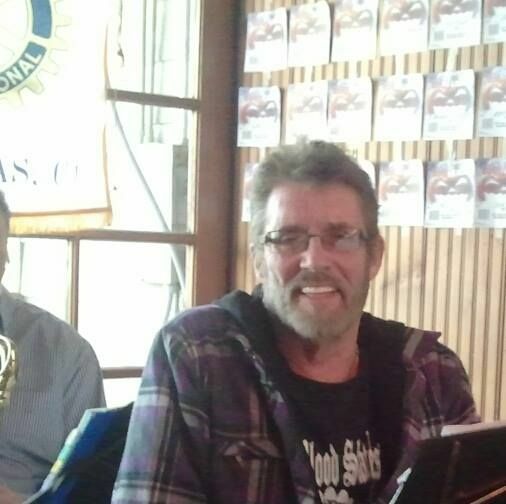 He will be sorely missed," Robbie Kass, Herrmann's manager told CNN. "My friend Ed Herrmann was the kindest, classiest, most talented man. It was an honor and a joy to know him, a devastating blow to lose him," tweeted Lauren Graham, who starred as Lorelai Gilmore in "Gilmore Girls." Sleep well, Mr. Herrmann. You had a long, illustrious career. A veteran voice actress departs. Christine Cavanaugh -- the original voice of "Babe" the pig and Dexter from "Dexter's Laboratory" -- has died at the age of 51. Cavanaugh passed away on December 22nd. Christine's work is legendary ... providing the voice of countless iconic cartoon characters including Chuckie the red-headed baby from "Rugrats." She also voiced characters from "Darkwing Duck," "Aladdin," "The Critic," "The Powerpuff Girls" and "The Wild Thornberrys." A long and prolific voice career, but 51? Way too early to go. Christine Cavanaugh was the heart of my most popular series. Without Gosalyn, Darkwing Duck would not have sold. And without Chrissy, Gosalyn wouldn't have had the balance of sweet and mischievous that made her such a memorable character. Sharing news of Laika's features screenings that came our way this morning. 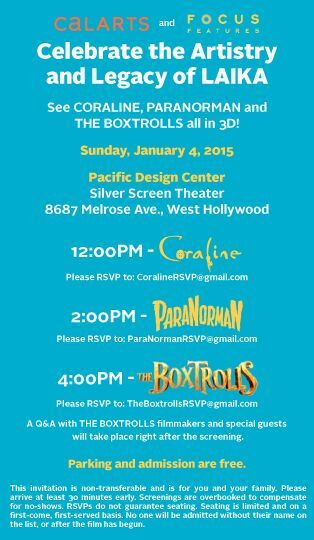 CalArts and Focus Films are sponsoring screenings of Coraline, Paranorman and The Boxtrolls at the Silver Screen Theater at the Pacific Design Center on Sunday, January 4. Tickets are available by emailing the addresses listed in the image above. Be sure to arrive early, as the fine print states the screenings are overbooked to compensate for no-shows and seating is granted to those who are on the list on a first-come, first served bases. Fox continues to be the only broadcast network that programs prime-time animation, with the other three ceding the territory to Rupert's minions. Meantime, FG continues to attract its key demographic in significant numbers, even as Mr. MacFarlane spreads his empire in new directions and absents himself from Fox Animation's studios. Staffers told me that Seth wasn't reviewing designs, scripts and boards with the same close scrutiny of earlier seasons. (It's sort of hard to do that when you're on the east coast shooting Ted 2.) When he's not on location shooting, he spends a lot of his time at his Beverly Hills office. But delegating more authority to directors, story supervisors and others is a good thing. The show has been in production a long time, and the fact that ratings still rock, even without Mr. MacFarlane topside in the wheelhouse every day, reflects well on the strength of the FG staff. Diz Co. prez, pushing envelopes? “Blue sky” experimentation has always been part of Disney’s ethos, going back to the days of multiplane cameras (to add visual depth to the background in the 1937 film Snow White and the Seven Dwarfs) and early use of lifelike robots (Disneyland’s Enchanted Tiki Room, which features electromechanical singing birds, pioneered the concept in 1963). But more than six decades ago, when founder Walt Disney first created Imagineering as the company’s innovative arm, virtual reality chambers were almost as far-fetched as talking animals. Fortune Magazine notes that Diz Co has, under Iger, become a tech company in a major way. I see it when I drive to Glendale and see its newer campus on Flower Street, a stone's throw from DreamWorks. The place is focused on internet entertainment and technical innovations. But the unspoken reality? Entertainment companies have to own big tech components if they intend to grow and thrive. The marketplace is dragging them along whether they want to be "tech companies" or not. It's not like there's a major choice. Having technology officers is what a company today has to do to prosper. The smarter conglomerates get that. Fees and taxes collected in foreign lands for writers and directors has been going on for decades. Some of this money gets remitted to American creators, and animation people are included in the mix. And it seems the current formula will get stretched out another thirty-six months. The multimillion-dollar Foreign Levies Agreement between the MPAA and the WGA and DGA, which had been set to expire on December 31, has been extended for another three years. The pact covers monies payable under foreign laws to writers and directors of copyrighted works in the U.S. In more recent times, the division of levies money has become a 50/50 proposition. The reason this deal is important to cartoon workers is that the DGA and WGA administer cartoon money and send out checks to Animation Guild members; the Animation Guild works with both organizations to insure that FL checks get into the hands that they're supposed to. If you're an animation writer or director and believe that you have foreign levy cash coming, check the DGA list or the WGA FAQ page and see what you need to do to receive foreign levies. Artists have to do it as much as anyone, here in the 21st century. ... AS THE BUSINESS of comics syndication has changed, tethered as much as it is to the fate and fortunes of newspapers, it has been especially great to see cartoonists enjoy opportunities in other creative realms in 2014. “Doonesbury’s” Garry Trudeau (“Alpha House”) and “La Cucaracha’s” Lalo Alcaraz (the forthcoming “Bordertown”) are largely writing for the screen these days. Read the Post article, and it's quickly evident that the newspaper comics page ain't what it used to be ... nor supplying the cash flow that successful comic strips used to pull in. With changing technologies and narrowing profit margins, comic strip artists have the same issues artists in animation have had over the past decade and a half: New technologies are upending older professions, so how to ink and pencil artists adapt to the new realities? Do they dig in and try to hang on, or move into another line of work? For animators, that has meant pivoting away from the light board and plunging into storyboard work, or retraining as a rigger or CG animator. In the case of comic strip artists, it's meant transferring story skills to script writing, or adapting work now appearing in the dying medium of newsprint to TV series and feature films. Sometimes that's meant live-action, other times animation. For some artists, it's been both. Adapt ... or live in genteel poverty. Many artists are opting for the first choice, because the second one is a wee bit grim. The question is, will Illumination Entertainment's second bananas perform better than DreamWorks Animation's second bananas? Frankly, I haven't the foggiest. Because I thought that Penguins would have performed better than it has until now. It's worth noting the large number of High-Grossing Pictures that are dependent on CGI/CG animation. Penguins has made almost three times as much overseas as it has in the U.S. and Canada. That's a wide difference, but then, Madagascar 3 made 71% of its $746,921,274 global take beyond American shores. The Times tells us that 2014 was sucky. ... After setting a record level of ticket sales in 2013, the industry experienced one of its worst summer seasons in years and struggled to rebound in the fall. Rentrak estimates that the 2014 movies will end up grossing $10.4 billion in the U.S. and Canada, about 5% less than last year’s $10.9 billion. DreamWorks Animation calculated that a comedic spin-off from a major franchise would pack them in, but the calculation turned out to be wrong. It's not that audiences won't turn out for animated features, or that there's too much animated product out there. Audiences simply won't buy tickets to product they find non-compelling. Based on current evidence DWA has under-achieved of late in the "want-to-see" category. But studios' successes and failures generally happen in waves. When a feature animation brand is hot, the momentum often lasts for several pictures. And when a company is mired in a ditch, it usually stays there an uncomfortably long time. It took years for Disney features to make a comeback. The same may end up being true for DreamWorks Animation. Already though, the studio is looking for a second site nearby to house almost as many staff again [as the initial 180], as the Star Wars workload increases and it takes on more work, including the forthcoming sequel to the Marvel superhero blockbuster Avengers Assemble. What's left unsaid here, as it is left unsaid about lots of articles regarding CG studios around the globe: If the Free Government Money and/or Really Low Wages go away, so does the work. It will be interesting to see how much CG work the oncoming Free California Money attracts. My bet is that it will be some, but certainly not a ton, because there are taller stacks of Free Money being offered in London, Vancouver, Montreal and several other places. ... to the CG feature biz. The trailer emphasizes action, suspense, and dramatic angles. And clockworks reminiscent of The Great Mouse Detective. It's amazing to me that a country getting ripped apart by sectarian strife is making animation, but then, parts of Pakistan are probably tranquil. It's just that the tranquility is difficult to discern from half a world away. ... Welcome to the new television Peanuts series, en francais. (Translation: "We're going to have a good doctor-patient relationship, or I'm going to slug you! Do you understand?") Debuting last month, these 500 cartoon shorts featuring the iconic American characters are being scripted, animated and broadcast only in France. Bill Melendez Studios, south of Paramount Pictures in Parchment, was headquartered for decades in three small residential houses that sat side-by-side a half block from the business district. Charles Schulz liked the way that Bill Melendez drew his characters, but Bill and Mr. Schulz are dead. Time grinds on, and the Normaal Studios in France now create television shows with Linus, Lucy and Charlie Brown. Without, sadly, a cartoon occupying the Top Ten list. Big Hero 6 is now at #13 and closing in on $200 million, while Penguins of Madagascar, down at #16 (yes, Virginia, it's fallen past Big Hero) creeps toward $70 million. We're not talking Andy Devine's sidekick (and you have to be of a certain age to understand that reference) but a cartoon of renown. 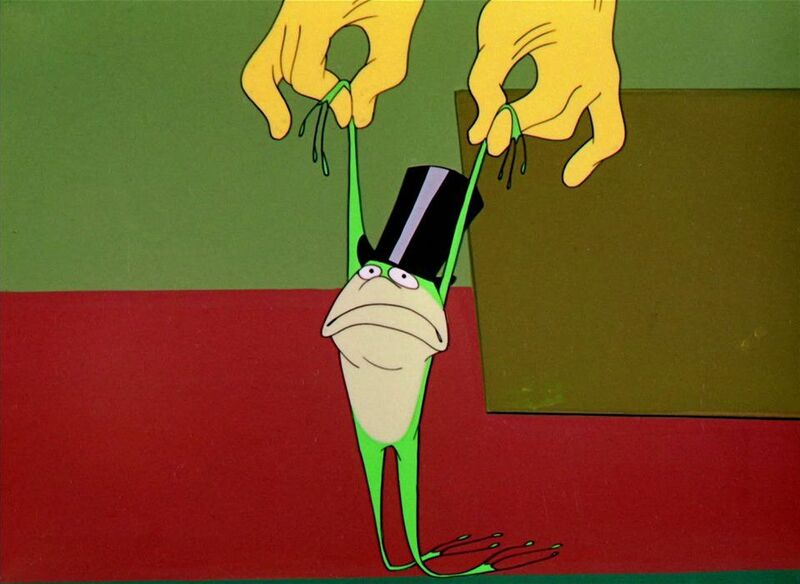 Dec 25, 1955- Chuck Jone's 'One Froggy Evening' premiered. Director Steven Spielberg called it the "Citizen Kane of Cartoons." If you wonder why you never heard the old-time ditty 'The Michigan Rag' anywhere else but here, was because Chuck Jones & Mike Maltese wrote it specifically for the cartoon. Isn't that usually, like, a person? Guess not. Poor Taylor. Edged out by a cartoon. It is, after all, when all the pixie dust and other glitter has floated back to earth, about the $$$$. For the past few months, we've been working with OPM Design Group at putting a fresh face on the Guild website. The biggest design change was implementing a Responsive Web Design scheme which should give visitors the same experience on the site regardless of the device they use (from mobile to desktop computer). An Online Store where clothing and other items featuring the Guild logo will be sold. We hope to see the new site deployed within the first quarter of next year. 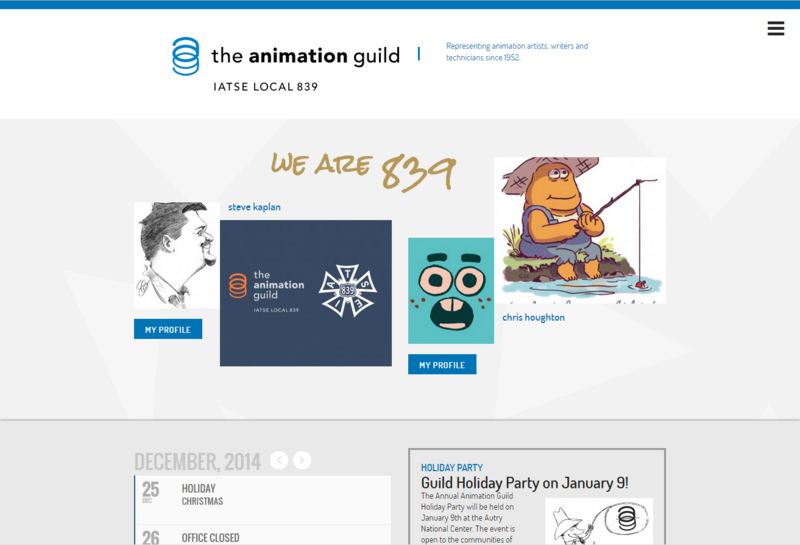 The Animation Guild Blog has been an ongoing project for the past eight-plus years. With the redesign, we'll be putting the blog more directly onto the union website. This means that, for awhile, there will be a blog under Wordpress and a blog under BlogSpot ... in two different internet locations. Don't know how long things will continue that way, but expect tweaks and changes as we travel along. We now return you to your holiday activities. 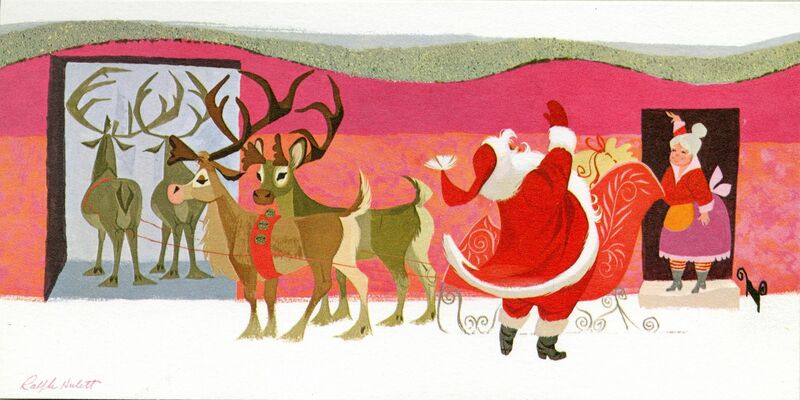 And St. Nick gets ready to depart with Donner, Blitzen, Rudolph, etc. Everyone here at the Guild office wishes you the merriest of holidays, and that you have a safe and happy Christmas Eve. Apparently some CG cartoons triumph on the small screen. ABC’s one-two punch of Shrek the Halls and a Toy Story That Time Forgot encore topped Tuesday night, besting an uberpopular boy band along the way. Maybe ... since the spin-off pictures aren't doing it for DreamWorks Animation, the studio should go back to the root of all blockbusters and do another Shrek feature. This is corporate well-being we're talking about here. If Universal can make Jurassic Park IV, isn't it time to bring back the green ogre? 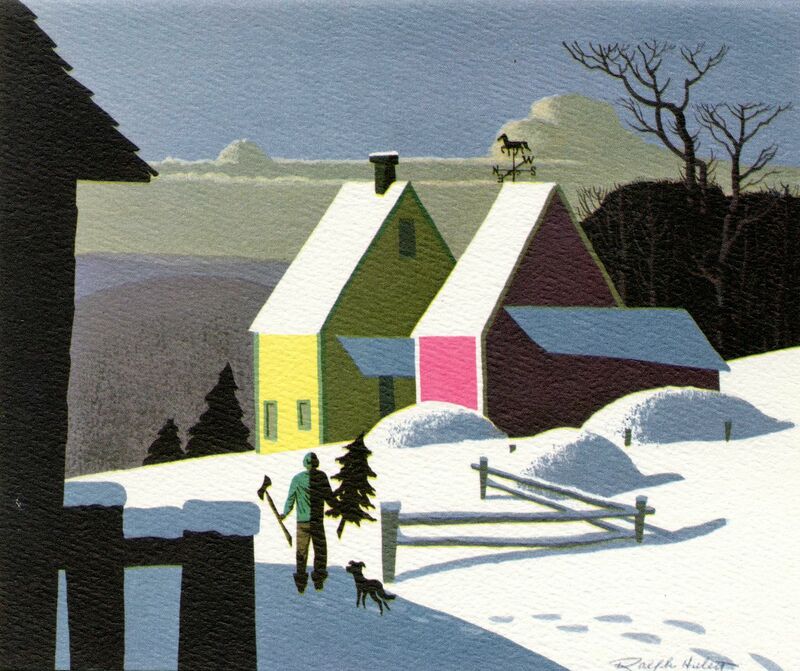 We've run a couple of hundred Christmas cards from the brush of Ralph Hulett (my artist father) over the years, but seem to be pretty well out of new designs. There might be a handful that we've missed, but we run this one from a few years ago because it's ... pretty. So instead of running none, we offer a few golden oldies. Hope they please you. From the crew at BB. ... Animated by the team behind the show, The National star in the video as ornaments hanging from the Belcher Christmas tree. The song is a sobering message about the plight of the homeless, with the song’s narrator singing about how he and his family “will be warm tonight,” while there are hungry people dying in the streets. ... The National Labor Relations Board and the Labor Department’s Wage and Hour Division ... spent the past decade largely crippled by congressional obstruction, first from Democratic majorities and then from Republican ones. Now freed from those obstacles — at least for the moment — and operating under Democratic leadership impatient to make up for lost time, these agencies are promoting workers’ and unions’ rights more aggressively than Washington has witnessed in a generation. Happily, the older Miami Cubans who froth at the mouth at the mention of Fidel's name are dying off, and their children and grandchildren don't give two shits about Mr. Castro one way or the other. LAIKA and Focus Features today announced production on their fourth collaboration, Kubo and the Two Strings. LAIKA President & CEO Travis Knight and Focus CEO Peter Schlessel made the announcement today. Mr. Knight, an Annie Award-winning animator, is making his directorial debut on Kubo and the Two Strings. The new movie, from an original screenplay by Marc Haimes and Chris Butler (ParaNorman) is a sweeping, swashbuckling adventure set in a mythical ancient Japan. It is being brought to life at LAIKA’s Oregon studios via the company’s innovative 3D stop-motion and CG hybrid technique. In addition to directing, Mr. Knight is producing Kubo and the Two Strings with Arianne Sutner (ParaNorman). The all-star voice cast includes Academy Award winners Matthew McConaughey and Charlize Theron; Academy Award nominees Rooney Mara, Ralph Fiennes, and Brenda Vaccaro; and Art Parkinson, who plays Rickon Stark on Game of Thrones and who is providing the voice for the title character of Kubo. We've been aware of the new LAIKA production for a while now; they've been staffing up and we've been reviewing a number of immigration visas for various non-citizens soon-to-be-working on the picture. Boxtrolls, LAIKA's latest film, remains in release with a worldwide gross of $107,678,836. Two animated features in the Big List ... and lots of live-action heavy with animated effects. Big Hero 6 has raked in close to $200 million domestically but is rolling out slowly beyond domestic shores. The Hobbit: Battle of Five Armies has raked in $105.5 million from 59 foreign markets. Meantime Penguins has made almost 70% of its $200 million global take in foreign lands. Dec 21,1937 - Walt Disney's "Snow White and the Seven Dwarves" had its grand premiere at the Cathay Circle Theater. The first feature length American cartoon, it became the box office champ of 1938, earning 4 times more than any other film that year, mostly with kiddie half-price matinee tickets. Chuck Jones, Bob Clampett and the Warner team attended the premiere, and were inspired later to create the character Sniffles. My favorite story was that of animator Shamus Culhane. As he walked up the red carpet he passed two autograph hounds behind the rope line. They pointed at him" Hey, is that somebody? Nah, that's nobody." This bugged him as he watched the show, but after the film ended to a thunderous standing ovation, he thought "Screw you bastards. I just did something that will be around long after you both are dead. I AM SOMEBODY!" Final thought: Tom doesn't mention it above, but Shamus Culhane (for whom Mr. Sito worked) is the only animator who animated on the first three "Golden Age" features. Shamus animated on Snow White, Pinocchio and Gulliver's Travels. "Snow White and the Seven Dwarfs"a ended up the highest grossing feature on 1938. The film collected $9 million at the box office, which was then a record. t held the title for nineteen months, until "Gone With the Wind" filled houses at roadshow prices in 1940 and 1941, pulling down $22 million in the process. The Civil War picture remains the highest grossing movie of all time, when box office dollars are adjusted for inflation. The Peter Jackson movie seems to be doing well. Penguins of Madagascar and Big Hero 6 appear to be neck and neck, except that BH6 has been out three weeks longer and has accumulated $187.8 million, while PoM has collected $62 million. Dec 20, 1968- "My Pooh Bear, it certainly is a blustery day..."
This first of the Pooh featureless follows the Milne books closely, and is generally considered the best of the first three featureless, which were later combined into a feature. Wooly Reitherman directs, and scripted by Larry Clemmons, Ralph Wright, Julius Svendson and Vance Gerry. The Nine Old Men animate Winnie and his cohorts with their usual skill and aplomb. There was the thirties and early forties version ... then there was the Disney Renaissance in the first half of the nineties. ... The Netflix series [All Hail King Julien] is a prequel, set at the time of Prince Julien's ascension to the lemur throne after his Uncle King Julien (Henry Winkler, continuing his productive late period) suddenly abdicates. In fact, he is throwing his nephew into the jaws of what he believes is a fatal prophecy, and planning to take back the crown after that dust settles. As in the film, the lemurs are threatened by the fossa — the island's predatory cats. Although it's common enough in animated feature films, this is the rare short-form cartoon series in which the threat of violent death underlies the action. I talked to a director who said it's been a challenge to find seasoned storyboard artists and storyboard supervisors because (as was related to me) "anybody with experience, and who's any good, is already working." I confirmed that this was true, that things are tight all over, and I had visited a studio the day before where the supervising director said he was going to have "to build a crew from scratch" and he was dreading it. "Because the pickings beyond the studio walls are pretty slim." This is a good thing for newer artists, because it makes it easier to break into the business. Lots of shows are getting produced, and lots more opportunities for a paycheck present themselves. On the other hand (and there is always one of those), DreamWorks Animation's feature division continues to lay off artists as production schedules are rejiggered. An under-performing feature hurts. But (happily) the television product will be getting made for the next three to four years and should produce income streams far into the future. It commenced with one woman. [Vanessa] Coffey began by producing an [animated] Thanksgiving special for Nick. 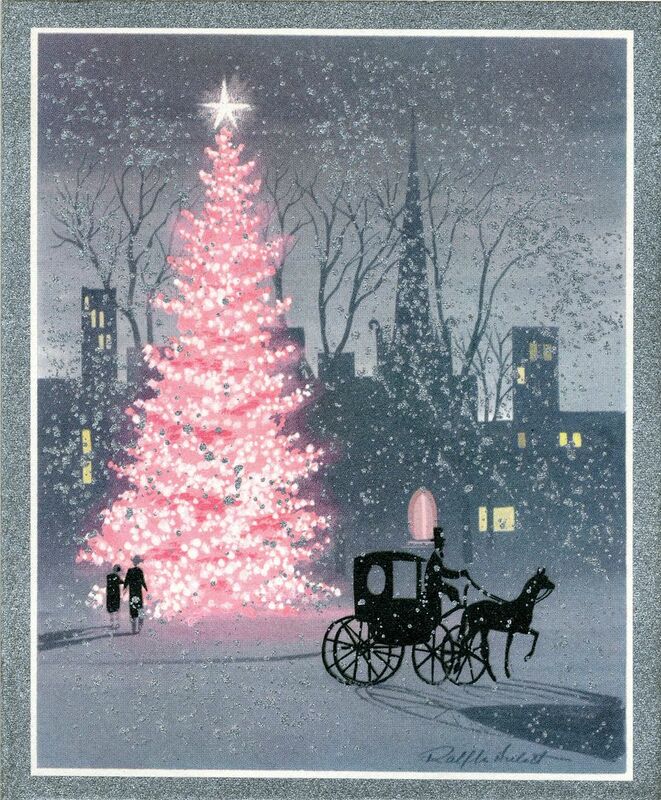 At that point, the studio had only done animation once before, in the form of a Christmas special led by Ralph Bakshi. Soon, she started a dialogue with then-president Geraldine Laybourne and her team about recruiting original content. ... "That was the most amazing time in my life working on 'Ren & Stimpy,'" Coffey said, "But the situation with John was the most painful situation of my career." The first six months came with playful disagreements regarding notes. As Coffey recalls, it was only after "Ren & Stimpy" aired with great ratings and garnered a college audience that Kricfalusi became difficult. "He turned," she said. "He said this on the phone: 'I'm the star. I'm making your network. It's all me.'" Back in August, Kricfalusi expressed his frustrations. "I told her to think of it as though she got to play Santa. You don't give the kids presents that you want for yourself, do you? Kids don't want socks and underwear, they want toys and silly stuff," he said. "I thought to myself, 'Have you ever met a kid?' Who doesn't know that kids think rude things are funny?" Coffey insists she was just doing what needed to be done to get the show to air. "I wasn't being a big bad executive," she said. "It was my job." I remember when the John K. kerfuffle went down. There were screams of outrage and anguish when Mr. Kricfalusi was dismissed from the show, but the series went on without him. And John Kricfalusi went his own professional way. The lesson I draw from this? In conglomerateland, almost all cartoon creators are fungible. Unless your Steven Spielberg or Michael Bay, an executive can Deep Six you on forty hours notice. I often tell newbies, "Learn to play well with others" (learned from cold, first-hand experience). Artists seldom get their way all or even three-quarters of the time, and it's useful to know this fact of life right out of the gate. If John Kricfalusi had owned the knowledge at the beginning of his Ren and Stempy career, perhaps he would have remained on board to supervise all of the R & S episodes, instead of just some of them. As you may be aware, Sony Pictures Entertainment ("SPE") experienced a significant IT systems disruption on Monday, November 24, 2014. The IATSE has been in discussions with the company since then to determine what risk our members may face regarding the potential disclosure of personal information and data. SPE has determined that the cause of the disruption was a cyber attack. After identifying the disruption, SPE took prompt action to contain the cyber attack, engaged recognized security consultants and contacted law enforcement. SPE learned on December 1, 2014, that the security of certain personally identifiable information about its current and former employees may have been compromised. SPE has made arrangements with a third-party service provider, AIIClear ID, to offer 12 months of identity protection services at no charge to potentially impacted current and former production employees of SPE or an SPE-affiliated company. And there seems to be some teeth-gnashing at all this. Also teenaged girl type fear. (All due respect to teenaged girls). Nothing against Mr. Clooney, but Hollywood has always been cowardly. As novelist Raymond Chandler said seventy years ago, "The Hollywood big shots, they're terrified of losing all that fairy gold." Which of course explains why, in the fifties, studios and labor unions could be bullied by the House of Un-American Activities Committee and Red Channels into black-listing artists and writers who didn't toe the "True American" line as defined by HUAC and Red Channels. The fear of losing big bucks; it's a fabulous motivator, no? What's one movie, more or less? What's a pack of lousy movie actors and writers? North Korea and/or its agents are simply the latest bully boys to show up in show business's neighborhood demanding that a movie they don't like be pulled. It's not really much different than those earlier power brokers' demands that creators with impure thoughts be banished from the creative landscape. Seeing Hollywood get rolled by thugs with brass knuckles is as old as the movies. The only thing different this time is the newer technology being employed. More cartoons on more platforms. The bad thing is, the newbies are underpaid and Fox happily keeps feeding ADHD work. TAG's job is to convince the crew that there's a road to higher (as in livable) wages. And quality benefits, they're good too. Because, friends and neighbors, the animation business in Los Angeles is all of a piece. If Studio X starts paying skim milk wages to the artists turning out its shows, that puts downward pressure on salaries at other studios. This is nothing new. Years ago, a Disney TV Animation timing director was collecting union wages at her home studio while picking up freelance work at a non-signatory company that was way under going rates. I didn't think there was much point in asking her to knock the behavior off (money is money, after all, and she was out to collect as much as she could), but I told her fellow directors what she was about. They weren't happy and talked to her. She wasn't happy that I had made an issue of it, and snarled at me to "mind my own business" on the phone. But this is simple, really. If pay unravels at one place, the odds are higher it will unravel at other places. Econ 101. Yes, some multi-employer plans, particularly manufacturing pension plans centered in the mid-west, could see some payout reductions to current participants under 75. ... The U.S. is almost unique in its reliance on private, company-sponsored pensions instead of comprehensive, government-sponsored benefits. The changes in the spending bill, which could permit cuts to multiemployer private pensions for about 10 percent to 15 percent of the 10 million workers in such plans, are framed as a necessary measure to preserve the solvency of the PBGC. But on a deeper level, this step is a harbinger of the ultimate demise of a private pension system that has outlived its usefulness to the business community. The drumbeat today is to demonize employees who still have livable pensions ("Hey now, aren't those people greed-heads? Why should they have nice monthly checks while you don't?") so that other working stiffs are angry about it. I look forward to the day when few have any kind of significant retirement and everyone works into their eighties ... because that's when Social Security kicks in. It was heart palpitation time. ... At two o’clock the Basil story crew stood tensely in the second-floor hallway of 2-D, waiting for Jeffrey’s arrival. At two after two he came striding down the hall, shook hands with everybody, and I launched into my spiel about a detective mouse in London, his arch enemy Ratigan, and the nefarious plot to take over all Mousedom. 1985. Jeffrey was the dynamo from Paramount Pictures. And I thought (silly me) that I would be going places in my Disney career. And we'll call this "Self Aggrandizement II". But it's late and I can't think of anything else to put up. It's always a confusion why the show with the most viewers, Barbara Walters for example, isn't the winner. But to own the "old people" audience is almost like having corpses goggling at the flatscreen. You need to have the high-value, 18 through 49 demographic. ... Thanks to Warner Bros. Animation, “Elf: Buddy’s Musical Christmas,” a one-hour special that airs Dec. 16 on NBC at 8 p.m., with Jim Parsons voicing the titular character originated by Ferrell in the 2003 pic. Animation house Screen Novelties, which specializes in stop motion, created the TV version. “Warners thought doing it in stop motion would be cool, given the art’s historical ties with Christmas specials,” said co-founder Seamus Walsh (above, center). Stop motion will never die, so long as their are television Christmas specials (and Henry Selick). Therefore my calculation of $105-$135 million in domestic grosses looks a teensy bit off. The picture isn't going to hit a multiple of four (4) in the U.S. of A., which means DreamWorks Animation has some long thoughts to wade through. Penguins was shifted (in part) because wise studios heads thought it would perform better running up to Christmas than in March 2015. Every studio has its ups and downs. Disney went through a rough patch at the turn of the century where it created very few films that connected with the public. At the same time, DreamWorks had a large and stable staff turning out one money-maker after another. And now it's Walt Disney Animation Studios that's on a roll, while DWA isn't achieving lift-off with the majority of its releases. When you're around animation for a while, you understand that the studios in the industry are much like pistons in an engine: one of them is up while another is down, it's just the way he business seems to be. The difficulty is, DWA isn't part of a monster conglomerate like its competition. And that spells TROUBLE, right here in L.A. city. A 1927 Disney Christmas cartoon thought to be lost was discovered in Norway, Agence France reports. Thought a rabbit, Oswald is a close cousin of Mickey. And five will get you twenty that Diz Co. soon buys this flick for a princely sum. Then they'll add some bells and whistles and copyright it. ... [A]nimator and director Robert Taylor passed away last Thursday, December 11th, from complications due to COPD. He was 70 years old. Taylor is perhaps best known for directing The Nine Lives of Fritz the Cat (1974) - a sequel to the first X-rated animated feature Fritz the Cat - as well as Hanna Barbera's Heidi's Song (1982). Taylor began his career in 1966 co-directing Mighty Heroes and Sad Cat with Ralph Bakshi at Terrytoons. Taylor had worked with Ralph Bakshi in various capacities (layout, design, animation) on a number of his animated features, including Heavy Traffic, Hey Good Lookin' and Wizards. He went on to work in later years as an animator, story man, layout artist, producer, screenwriter and director on various animated TV shows for Disney (Bonkers, Goof Troop), Hanna Barbera (Scooby Doo, Superfriends) and Klasky Csupo (Wild Thornberrys, Rugrats). One of his many projects was the unreleased Hanna Barbera feature Rock Odyssey (1987). It was an adult skewing history of pop music, narrated by a jukebox (Scatman Crothers). Though Hanna and Barbera get co-director credit, it's known that Taylor actually headed the project. His daughter has released this information: "His memorial service is open to any and all that knew him or followed him in his life. His service is Saturday, December 20th at the chapel at Oakwood Cemetery in Chatsworth, CA. It is a beautiful location and he shall be buried there immediately following the service. The ceremony starts at 10:00 am. I know my father would have loved his friends and colleagues to attend this special event and celebrate his life. If you cannot attend, I thank you for knowing him and being with him there in spirit." Our condolences to Bob's family. Three score and ten is too soon to leave. We have lost a bright link to animation's past. Someone who was there near the beginning, when a small studio in Hollywood turned out whacky, black-and-white cartoons that are still watched ... and laughed at ... around the world. 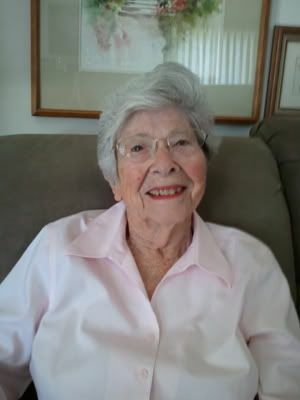 Martha Sigall, who worked alongside Clampett, Jones and Freleng (among numerous others) went to her rest today. She was ninety-seven years old. During the depths of the Depression, Martha Sigall was a neighborhood kid who ran errands for artists at a small animation shop who worked at light boards. Little did she know that it would lead to a half-century career creating cartoons. The studio was in some small buildings in Hollywood and owned by a man named Leon Schlesinger. 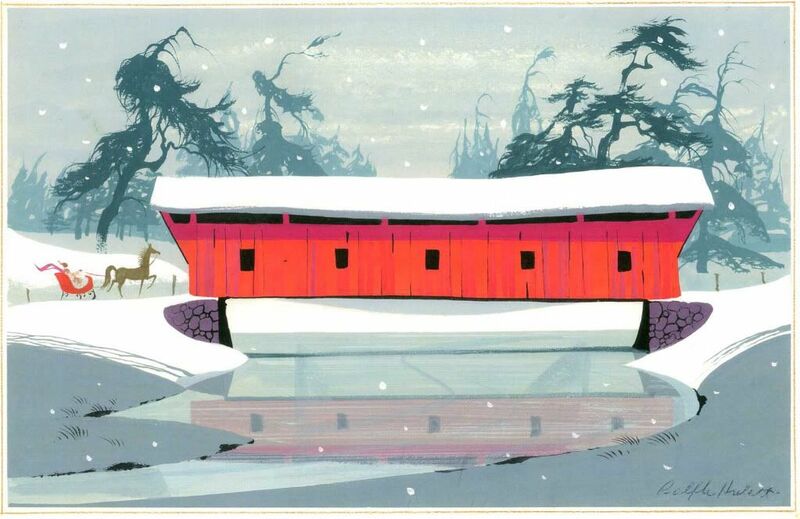 Martha painted her first cels before she was in high school, and took a full-time job in the business when she turned nineteen. Martha went on from there, ending her journey today. Federal officials unveiled new rules on Friday that will streamline and simplify the union election process, a reform long sought by labor unions and fiercely opposed by businesses. You may have noticed that in our charming corporatist state, the land of Socialism for Mega Banks and the rich, Free Enterprise for the poor, that unionized work-places comprise a much smaller percentage of corporate America. This trend has been going on since I graduated from college, and we now have about 14% of the work-force under the wing of guilds and unions, about the same ratio we had a century ago. Entertainment unions are outliers here in Freedom's Land. They still represent a large part of motion picture and television workers, even as other areas of employment slip away. The Animation Guild has had some momentum on its side these past few years, as we've organized a number of non-union cartoon studios in Los Angeles. The new rules will help TAG and other labor unions secure better wages and benefits for people they strive to represent, which is a good thing. On Friday, there were two American animated features in the Top Seven Features in the U.S. of A. and Canada. Stolen emails from Sony Pictures reveal the studio tried and failed last summer to recruit Phil Lord and Chris Miller to take over its animation division. To be fair to Mr. Osher, management persons before him haven't gotten rave reviews from story artists or designers either. Bob Osher is just the latest top-kick about whom artists complained when I walked through the doors. Some of it you can chalk up to the general belly-aching that always ricochets around cartoon studios, but a lot of it was more than that. Sony Pictures Animation started off semi-promisingly with Open Season, but things slid downhill after that. The division used to have a director on board named Chris Buck (Frozen), but he's long gone. It used to employ one of the best story persons in the business, a man named Ed Gombert, who story-directed the features Aladdin and The Croods, but SPA cut him loose. Many other talented animation veterans have also departed over the course of time. Talking to Lord and Miller, it was pretty clear they were iffy about hanging around after the picture was done. Other employees told me neither of them cared much for management. More recently (and happily) Sony has brought in Genndy Tartakovsky, but is Genndy alone going to turn Sony around? Sony Pictures Animation and Sony Pictures Imageworks used to occupy the same Culver City campus; now Imageworks is a wee bit farther away in Vancouver. How that helps Sony's animated features to be better, I don't know. Certainly it will make them less expensive to produce, for the Canadians are throwing around lots of free money. But will that help them to be hits? If a union thug like me, ambling through the Spa/Imageworks campus every few months, can pick up on the general unhappiness, what drugs was management taking to miss it? The Mojo predicts a small drop for Penguins. To date, Penguins of Madagascar has collected $153,432,709 worldwide. It doesn't look as though it will turn into a blockbuster, and how Home performs (it's due out early next year) is anyone's guess. DWA thought Penguins was the stronger yuletide offering; I wonder if any DreamWorks execs are second-guessing the decision? DreamWorks Animation reconsiders the release date of a franchise. DreamWorks Animation has moved the release of “Kung Fu Panda 3″ to March 18, 2016, leaving its previous Dec. 23, 2015 date, where “Star Wars: The Force Awakens” is expected to dominate. The new date for “Kung Fu Panda 3″ means that DWA will need to find a new birth for “Boss Baby,” also dated for March 18, 2016. It's always a fine idea to shift a tentpole away from a monster juggernaut, which (let's face it) this new Star Wars movie is. The Globe nominees are out; you'll find them here. But let's get real about this award. The show is good fun, and the stars and big shots turn out in force to participate in the televised festivities. But the Golden Globes are a total and complete joke, chosen by stringers for the foreign press. It's been this way since the Globes beginning during World War II. Seventy-odd years later, Hollywood likes to pretend that the little trophies are significant in some way, but they're not. Except maybe that reality doesn't matter, because if everybody acts like the Globes are a Big and Important Deal, then by grab, they ARE a big and important deal. I fully expect months of surprises as new caches of information are put out there by the people who hacked Sony's data. I fully expect lots of news stories in the near and middle future as small, bright bombs continue to go off. But for how long the explosives will be detonating, that's the question.